We recently came across leaked pictures of the Apple iPhone 6, followed the iPad Air 2 and today, we have an alleged group picture of upcoming Apple iDevices including the iPad mini 3. The new picture comes via Apple.club.tw. The picture doesn’t give away much but we can make out that the even the iPad mini 3 will feature the TouchID fingerprint scanner, thus proving previous reports right. Sadly, that’s all we know of the tablet, as the leak does not give out any more information. The inclusion of TouchID in all upcoming products is the right way to go for Apple, considering the company has opened up TouchID for third party apps with iOS 8. 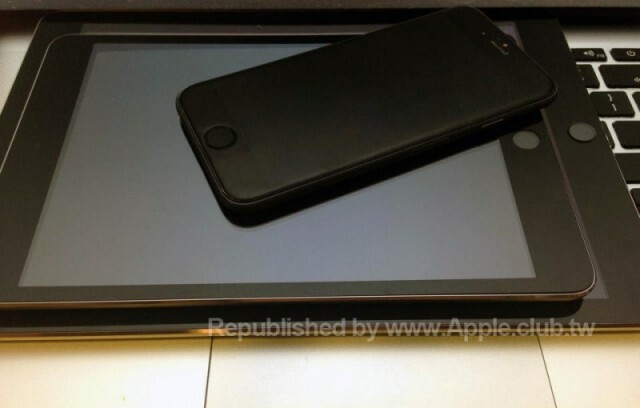 While we have had several iPhone 6 leaks for both the 4.7-inch model and 5.5-inch model, we got a look at the iPad Air 2 for the very first time last week. This is the first time we are getting a glimpse of the iPad mini 3 and while we don’t get to know or see much, we’re glad with the inclusion of TouchID. There’s still some time to go before Apple finally makes these devices official, so we should know more soon.